Colm Cavanagh has been involved in the Tyrone squad since 2007. HE HAS 11 seasons done now with the Tyrone footballers, was an established pillar on the team that contested this year’s All-Ireland final and has picked up two consecutive All-Star awards. Yet before reaching his current peak, Colm Cavanagh experienced the difficult days as he sought to establish himself. He is mindful of that struggle in the early part of his Tyrone career as he withstood criticism and attempted to create his own Gaelic football identity as his older brother Sean starred on sides managed by Mickey Harte. “I came into a team that was quite successful and had all the household names but, to be fair, I was probably unlucky. In 2007 I started the first few championship games for Tyrone and that was my first year, at full-forward. I got injured, carried off in the first game and rolled my ankle in the second game. “2008 was similar, I started the first day up against Down and then I rolled my ankle again and was out until Westmeath up in Omagh where I dislocated my shoulder and I was out then until the All-Ireland semi-final. My early years were a bit bothersome. “It took me a few years to probably nail it. I probably took plenty of flak in the early stages with Tyrone. It wouldn’t have been social media, it would have been message boards at the time and I would have been well aware of that. “It did annoy me but at the same token I read it and didn’t say ‘oh this is really getting to me.’ I’d just go ‘you know what I’m away to the gym here or down to the pitch here and get to where I need to be.’ It’s just having that focussed determined head on me during all them years. 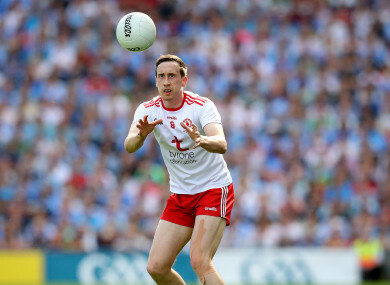 Cavanagh is content with his form over the past few years as he has grown in stature in the Tyrone ranks. His versatility is reflected in the various sectors of the pitch he operates in and his selection at full-back on the 2018 All-Star side. “I sort of found a wee bit of a decent role in that sort of sweeper type thing. The last number of years I’ve been happy playing and I feel I’ve been playing good football and sort of taking on more of a leadership role. “I think football has moved on from direct positions. I do see myself as a midfielder. I have tried to add more attacking, I scored more I think this year than I did last year. “The picking process (for the All-Stars) is probably at a stage where it’s very hard for people to do in that people are playing in every position. You see Conor McManus back defending at corner-back for a lot of the game so it’s difficult to put people in their spots. The semi-final victory over Monaghan was marked by a crucial late intervention from Cavanagh when he dispossessed attacker Jack McCarron. He feels his tackling technique has improved over the years and recognises the excellence of Dublin in that department of the game. “I was probably a reckless enough tackler (when he was younger). I was all blood and thunder, not very much coached. The game has evolved and people are very much focused on fine details. “I probably refer back to the Dublin lads because they are up there. You watch the way they tackle. I love basketball and I believe they have had a basketball coach with them at some stage and the way they tackle and back off you. “They are obviously coached to a very fine element because they very rarely will foul you unless they need to. The way they are coached to stand off, get the hand in and get back out again and try and do that, I love that. I think that’s brilliant. “Obviously, I have watched Jack (McCarron) playing. I knew he was going to for that bounce pass to go past you. It would have been very easy to stand off him and he potentially could have rolled me. 2019 will see Cavanagh back committing to the Tyrone cause as they set out with the rest of the chasing pack in an attempt to catch Dublin. “Dublin are still out in front. Everyone’s in the chasing pack behind and I’d be totally honest about that. If any team has any ambitions of catching Dublin at the minute, we’re going to have to do something different. There’s not too many teams that look like beating them at the minute. Email “'I’ve no problem now reading criticism or reading good things. I’m thick-skinned, I can take it.'”. Feedback on “'I’ve no problem now reading criticism or reading good things. I’m thick-skinned, I can take it. '”.